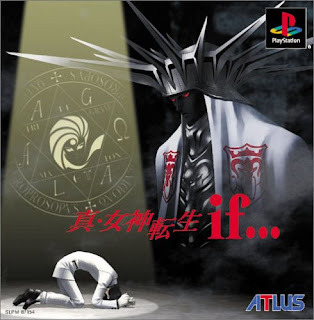 While reading through the NeoGAF discussion thread devoted to the announcement of Shin Megami Tensei IV's impending North American release, I came across this post--which featured the box art that was created for the PlayStation ports of Shin Megami Tensei I, II and If. Although I knew before encountering the aforementioned post that these games had been released for the PlayStation, I don't believe I'd previously seen the gorgeous pieces of cover art that Atlus created for them. Is it wrong that I now want to learn enough Japanese to justify the purchase of all three of these never-officially-released-in-English PlayStation games? Wow, those are great! 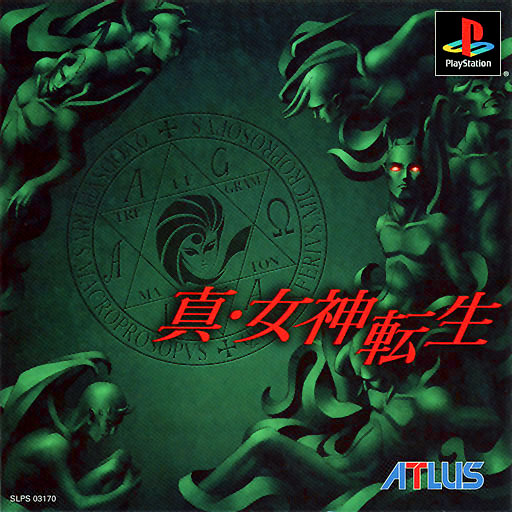 I love the art of the Shin Megami Tensei games. Too bad the first Persona game never was released here. Am I wrong or was there never even one release of a title from the original SMT series? BTW: it seems like Bravely Default will be localised outside of Japan. As for SMT being released outside of Japan--the series first left Japan with the release of SMT 3 (Nocturne). All earlier ones were Japan-only, as far as I'm aware. Oh, and, yes, I read that news about Bravely Default's western release, too. Hopefully it's true! I only have the first but yes, absolutely beautiful art, and even better when shown together! "Is it wrong that I now want to learn enough Japanese to justify the purchase of all three of these never-officially-released-in-English PlayStation games?" Well it's only wrong that you want these more than Soul Hackers, which is actually in English, will be readily available (for a brief period of time), and will be playable on a system you already own. BTW, I *may* in fact end up getting Soul Hackers some day ... just not at launch. Plus, isn't it supposed to be sold via the eShop as well? If so, I'll be able to pick it up that way and not have to spend $60, $80, etc. on it (which likely will be the case with the retail version shortly after it's released). As for me actually going through with buying the PS Shin Megami Tensei titles: I wouldn't bet on it, at least not anytime soon. Have you ever played any version of If... by the way? I've always thought it sounded interesting. Yeah, I forgot about the eShop thng. Not that I will ever by games that way when I have a choice (unless they're significantly cheaper there, of course). BTW, in case you aren't aware, there are fan translations for the original NES/SNES versions of 1 & 2 which might be a little easier for you to play. They've been working on a translation of IF for awhile, but it must be a tough one cuz nothing's come of it so far. Well, then, I look forward to you getting it some day and letting me know what you think of it! Hello miruki! I completely forgot that Nocturne was called Lucifer's Call in Europe. Kind of a cool name/subtitle, if you ask me. Also, I'm surprised some of the PS2 games haven't yet be re-released as PS3 Classics. Maybe soon? Yes I know of the DDS games, Persona 3 and 4, Devil Summoner on SP2 and the Persona 3 remake for PSP plus a remake of Persona 2. And of course the Persona 4 remake on Psvita. But now that Shin Megami Tensei IV is on it's way I asked myself if there was ever one of it's prequels released out of Japan. Hmm, I think I've read *something* about sony acquiring some sort of streaming service which would allow for some possibilities in that regard on the PS4.